View of the main entry for Semple Machines which includes administrative offices and productions facilities. The administrative offices are visible beyond the garden wall at left. 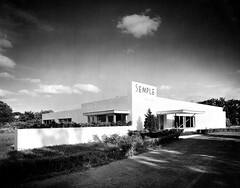 Armstrong designed the building according to the growing needs of Semple's rapidly expanding business.